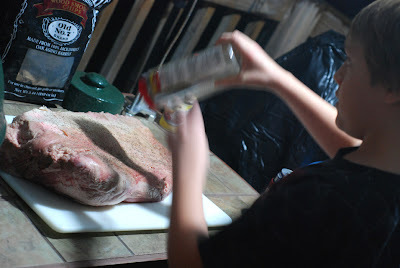 A few months ago, Howard of the Bent Elbow BBQ team suggested I do a post on brisket. Unfortunately, that's about the same as asking Shaq to teach a clinic on free throw shooting. So this post isn't a "how to". Brisket is a weak area for me. I've only ever done a few small briskets and only one full packer brisket before. 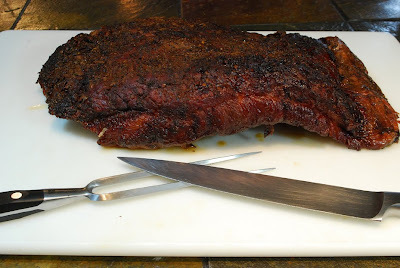 A wise man seeks the counsel of others so I reviewed this great brisket tutorial posted by Bigabyte on the BBQ Brethren forum and a few other sources. I went to see Scott at Lays Market who helped me pick a nice untrimmed packer brisket that reached from Knoxville to Chattanooga. Okay, it wasn't THAT big but it was 21 inches long. Problem, the large Big Green Egg is only 18.5 inches wide and since this was a overnight cook, I didn't want to use the offset smoker. 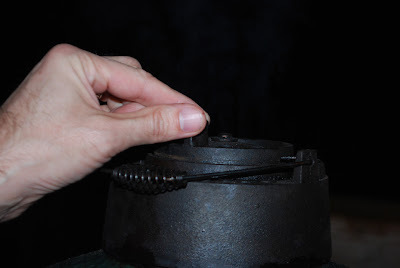 No problem, Bigabyte's post linked above gave the tip to roll the end of the flat up under itself. 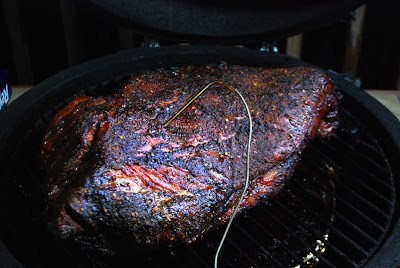 I smoked it using Jack Daniels Oak Barrel chips and lump charcoal at 250f. It took about 7 hours to hit 165f internal. I then wrapped it in foil with about 1/2 cup of beef stock and put it back on the Egg until it hit an internal temp of 200f. I separated the point from the flat and put the flat wrapped in foil in an empty cooler to rest. The scraps from the point were the best brisket I've ever tasted. 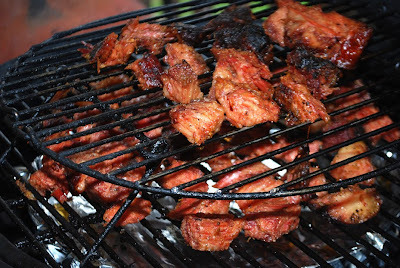 I cut it up, hit it with more rub, tossed it in sauce and threw it back on for "burnt ends". Honestly, the burnt ends were better before I threw them back on. 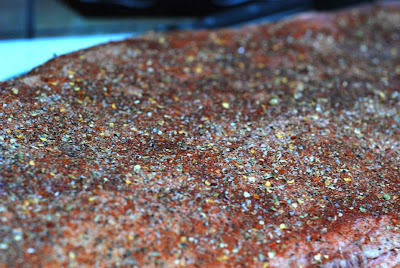 I need to go visit Big Dude to get some pointers on burnt ends. Then I took the flat out after a 3 hour rest in the cooler. Yes, you can tell from the pic I didn't trim it near enough. I was paranoid I'd over trim it. But despite all of the fumbles, gaffs, and miscues, it came out damn good. I know the next one will be even better. Speaking of some of the best brisket I've had, congratulations to George, Jim and the folks at Dead End BBQ. After just opening two months ago, they made the best of 2009 local eateries according to the Knox News Sentinel's restaurant critic. Way to go guys!